Hookahs come in many different sizes, appearances, shapes, and styles but only a few Hookah brands really stand out in the market. Khalil Mamoon Hookahs are known worldwide as being the authentic Egyptian Hookah that is preferred by many experienced Hookah smokers and lounges. 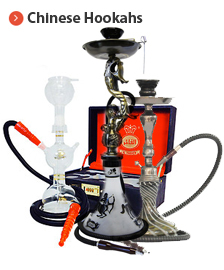 Mya Hookahs are known for their simplicity and clean appeal that is offered among high quality Chinese Hookah suppliers. Mya also has an Econo Mya Hookah line that caters to the budget minded Hookah smoker. Vapor Hookahs are known as a leading producer of economical Hookahs as well as high end Hookah Pipes at an affordable price. Vapor Hookahs also are available in all glass designs that cater to the serious Hookah smoker. SouthSmoke.com is sure to have the Hookah brand that will cater to all scenes.